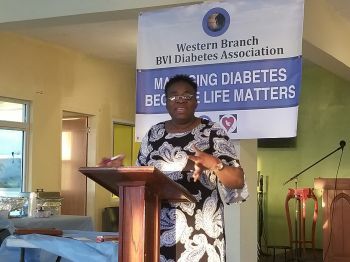 CARROT BAY, Tortola, VI- On May 10, 2018 the Western Branch of the BVI Diabetes Association held its first General Meeting of the year at the Seventh-day Adventist Youth Centre in Carrot Bay, under the theme Managing diabetes Psychologically and with Diet. In her opening remarks, Acting President of the branch Ms Gloria A. Fahie gave the general statistics of the disease worldwide. “422 million adults have diabetes, that’s 8.5% of the world's population,” she shared, an amount that according to the report has quadrupled since the 1980s. While no statistics are available on the progression of the disease in the Virgin Islands, it is believed that the trend is the same here. Everyone knows someone who is diabetic. Diabetes is a disease that relates to the body’s response to and use of sugars and can be of two main types; Type 1 and Type 2. The main idea of the general meeting was to share with persons living with diabetes and persons affected by the disease ways of coping with it. Sharing her testimony on living with diabetes was, Ms Lorna Lewis, a local resident who is now an amputee because of the disease. 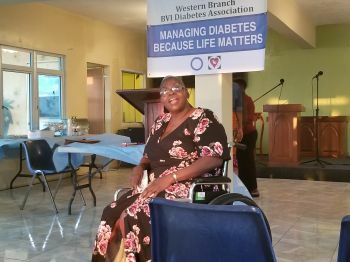 Ms Lewis shared how she was in denial for a long while after she received her diabetes diagnosis but when she subsequently learned that she had to lose her leg or it could cost her life, she quickly made the decision to allow doctors to remove the leg. This loss never dulled her spirits and even now, two years after, she is still optimistic and loves life, living it to the fullest. She did admit that losing her leg changed her life, but she is nonetheless happy to be alive. Her testimony no doubt resonated with the persons present, ranging from youths to senior citizens. The main presentation was done by Dr Virginia O. Rubaine, Director of Community Mental Health and resident of the West End area, in the form of a PowerPoint and discussion. 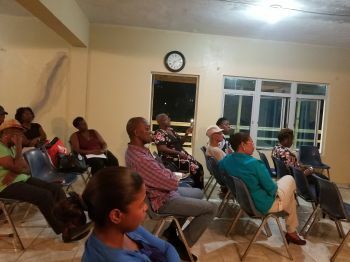 In the presentation that had all ears and eyes focused, Dr Rubaine explained that we all need to be active participants in taking care of our health. She also shared that it takes decided choices to be healthy, to watch what we eat and to generally live a healthy lifestyle. “What I can’t understand is, we see our neighbours, our relatives perishing from this disease but we are not making any changes,” stated. Persons were reminded how a simple activity as farming was good for every aspect of our lives; physically, emotionally, spiritually, occupationally, environmentally and intellectually. Attendees were also given may steps to manage and prevent diabetes. Dr Rubaine reminded them that a diagnosis is a life changing event and many persons respond differently to it. She advised that everyone who is diagnosed with the disease be counselled and that will help them to face the new challenges with confidence. 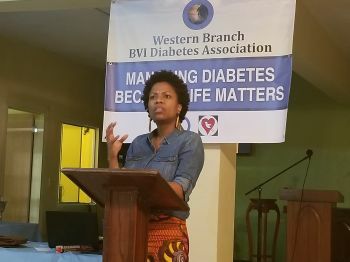 “If you are diagnosed with diabetes you have a 50% increased chance of developing depression,” primarily because the lifestyle changes that have to be made may be overwhelming and the support may not be there, she explained. The session ended with a brief meet and greet as persons shared experiences with others or gathered more information on what was presented. What do you mean by “This woman is sick”?